The latest craze in the nail polish world is really rockin' the boat. Forget reds and pinks, this winter you've simply got to have navy blue nails. All the top nail polish brands are coming out with super-hot shades that this beauty chick is just dying to try! Here are my top picks! Essie Aruba Blue: While the shade is dark, there's an inner luminescence that really makes it pop. OPI Russian Navy: The matte hue is so flattering, and it looks good paired with anything in your closet! Orly Witch's Blue: If this is what Orly's got brewing in the cauldron, then sign this beauty chick up. Piggy Polish Something Blue: My favorite part is the rose ring wrapped around the stem. Zoya Indigo: Zoya polish seriously stays put forever. The last time I had a mani with Zoya polish, it didn't chip for a week and a half! So of course I'm going to be using this gorgeous shade. 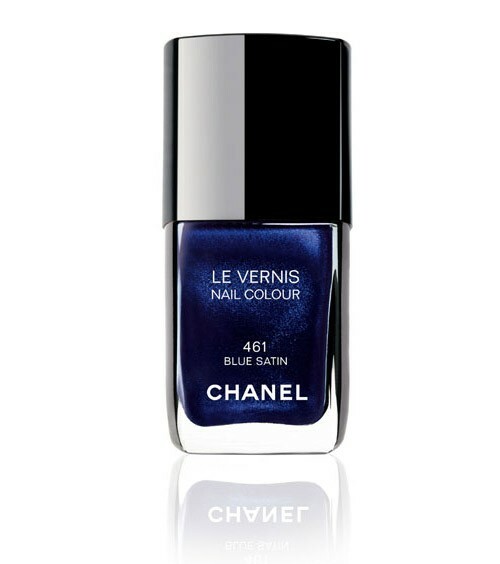 Chanel Blue Satin: Love. Love, love, love. I think this is my favorite. It shimmers, it glimmers, it glistens, it just makes your nails look fabulous. Wow so blue polish is back?! I used to wear crazy colors back in jr. high. Somehow I still have brightly colored polishes from back then that haven't gone bad yet...maybe I should start wearing some of them! Thanks for the trent alert!